This is an exciting project that we have been cooking up for some time. Lots of you have requested these and we’re excited that we can finally deliver! 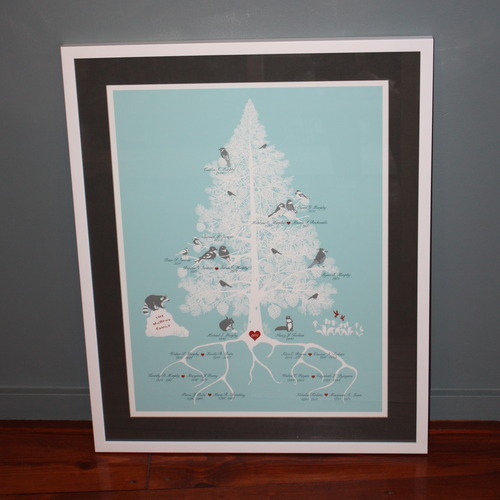 Our customizable family trees are here, available as a Pine Tree (for now!) just in time to start thinking about holiday gifts. Keep checking back as we roll out new designs for the different seasons. All images are digitally printed on archival quality paper and are available in a variety of ink colors. Please allow 4 weeks for design and production. Please be in touch for holiday delivery no later than December 1st, 2012. All creatures and names are customizable! Send me a line if you are interested and we’ll send you our custom order form!